Money Trouble in Penn State? Summary of Pennsylvania Usury Law(s) / Quote: "Legal: 6% to $50,000 Contract: 6.5% / Judgment: 6% / Corporate: No specific rate"
"legal rate of interest" and reference in any document to an obligation to pay a sum of money "with interest" without specification of the applicable rate shall be construed to refer to the rate of interest of six per cent per annum"
Active lenders in WFL pool serving Pennsylvania are based in Allentown, Pittsburgh, Harrisburg, Philadelphia, Scranton, Williamsport, and Wilkes-Barre. Mark in Harrisburg PA found himself behind on his bills for the first time in his life and reached out to us. In his pre-app he requested a $3000 loan over a 6 month term, and he wanted an interest rate of 7% or less. Sort of a tall order considering his FICO score was somewhere in the 430 range, and if you know anything about credit scores, that's very low. With a credit score in that range the traditional lenders won't approve you for any kind of credit. Furthermore, traditional banks and/or credit unions don't approve loans for $3000. The principal has to be more than that or it's just not worth it to them. So you're getting a clear picture here right. What does that leave then? Some would guess that leaves the predatory lenders (PDL and/or CA outlets). Well that's wrong too. The "fast cash loan companies" don't lend out $3000 either. They only approve loans as high as $1500 and that's only in some States, and only if the borrower is a repeat customer. OK. So if anybody wants to borrow between $1000 and $10000 they're out of luck. You would think a savvy lender would pounce on this opportunity. And from what we've seen over the last 14 years of running consumer small loan websites, there hasn't been a financial institution willing to step up to the plate on this opportunity. But that's just the conventional lenders. There's a new lender coming on the scene these days. They're not what you might think either. They're not PDL companies and they don't charge 450% APR. They charge between 6%-15% APR and they DO approve loans from $1000 to $10000. And you're probably wondering what kind of lender this is. Do they live in the mountains, or deep in the ocean? Do they dwell in caves? Do they practice good personal hygiene? All kidding aside, these lenders are known in the financial industry as private lenders. They're individuals and/or small companies and use that to their advantage so they can quickly find markets of opportunity, test the market, and move on if it's not lucrative enough. These lenders really started to make more headway when the peer-to-peer lending model was launched by Prosper in 2005. A lot of light bulbs started going off over a lot of heads in those days, and some of those heads realized the potential of a lending model catering to consumers who want to borrower between $1000 and $10000. But what does that do for people like Mark? I mean just because there are lenders willing to approval principal amounts in that range doesn't mean they're more likely to approve him. His credit score makes him pretty much untouchable. Something else about this new breed of lender is they're willingness to approve loans to people with bad credit scores. In some cases REALLY bad, like in the 400-500 FICO range. And I know, I know...you're thinking "yeah right". Well yeah. Right. The fact is that the vast majority of people who have been struggling with poor credit scores have had enough of being sanctioned from access to credit. They've had enough of it and they don't want to go there again. Therefore, their rate of default is only in the 8% range. So not bad right? The rate is quite high at over 15%. Not much lower than the starting rate on your average credit card, but over six months the total interest comes to $135 dollars and change. We have no idea how Mark handled his finances in the future. We have no idea if he even paid the lender back without missing a payment or defaulting at all. If you've never visited us at WeFindLenders.com before, you should understand how our service works. Once your application for credit is submitted to our system it's up to the lenders to get in touch with you using email. All of us at WFL are then 100% out of the loop. Because of privacy and legal concerns we cannot take part in any communications between you the borrower and lenders. If you live in the State of Pennsylvania and you're struggling with a bad credit rating we hope our website helps you in some way. Last 5 debt service loans approved in the State of Pennsylvania. Source: WFL Lender Pool. Updated Weekly. Principals rounded to the nearest $1000. Relative interest rates listed below in order left to right. Lenders, banks, and credit unions: contact us for listing removal. If you want to consolidate all your debt and only have one payment a month to worry about that's fine. However, you want to try and find a lender willing to approve your loan with a much lower interest rate than your current creditors. That's the main point of a consolidation loan. In the list of 10 providers above we listed 5 credit unions, and 5 banks. With these lending institutions you will have to a have a credit rating that isn't too far tanked. If you have a low credit score you may need to find a private lenders (still legal and legit of course) that caters to borrowers with bad credit. 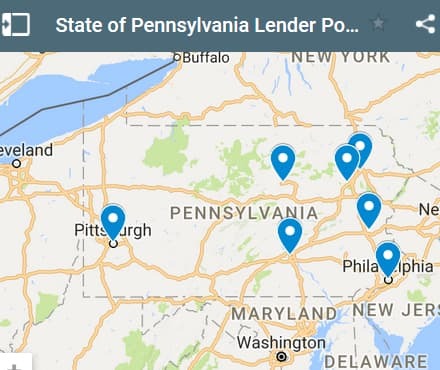 Even better, a lender that has loan products licensed for the State of PA. You can access our lender pool and get your application in front of local bad credit lenders, and you can do it right now. That's why the pre-app form above is called a "bad credit debt consolidation form" - it's only for people with bad credit. In Allentown PA Alexa found out she was pregnant. Normally, that would be a great thing, and she should have been excited. But there was a problem. She was single and broke. Her overall debt had piled up in a big way over the last three years. Her work schedule was sporadic (to say the least) and she had one two many wild weekends with her friends. They would travel to go to the lake in the summer and she would let the credit card go wild. Alexa's friends were all in a different financial situation than she was. They were are all "rich kids" generally speaking, and she could never really keep up with them in the "spend money like a millionaire" club. Because she always said yes to whatever plans for fun their group had, her Visa and American Express balances skyrocketed during the summer months. Then in the rest of the seasons she would squirrel money away each month to pay down her debt. But this cycle didn't last and she went to through a period where she couldn't work because of an injury. This really threw a monkey wrench into her day to day life. She was no longer able to make payments on her ever growing credit card balances. In an effort to get the collection agency hounds off her back she got more credit cards. Taking money from Peter to pay Paul is no answer to your debt problems. We have to eliminate as much spending as possible first and foremost. Without a big change in your spending habits you're just going to bury yourself even deeper in debt. Likewise, without a big positive change in your monthly earnings you're bound to be sinking in debtor quicksand (look it up - it's a thing). In Alexa's case she found a website that uses the WFL lender pool network. She filled out her pre-app online and had a couple of phone calls the next day. Both lenders were private lenders operating in the Allentown area. Their interest rate offers were higher than her local credit union or banks but lower than what she was paying to the credit card companies. She chose the lender that had a mandatory credit counseling course and she went forward with the loan agreement. She completed her realistic budget and stuck to it. She learned to stop spending so much money on "fun stuff" and only spent money things she really needed (like paying the phone bill, rent, and utility bills). Another thing she learned was to never try and "keep up with the people who have a lot of extra spending money". That's just a recipe for disaster. Now there is a happy ending to this story. A few months after getting this loan granted, she got engaged to the young man who is the father of her child. Her son was born and they were married in her parent's backyard. Her husband Ralph has a very good job working for a car dealership and he's been there for over a decade. He also had really good credit (over 800 FICO). He owns a home too so he used his HELOC (Home Equity Line of Credit) to pay off her loan completely. The interest rate he paid was only 3.21% which is a third of what she was paying on her original loan. It's too bad we don't hear more happy endings like this. There are many cases when no "prince charming" comes by on his white horse to save the day. 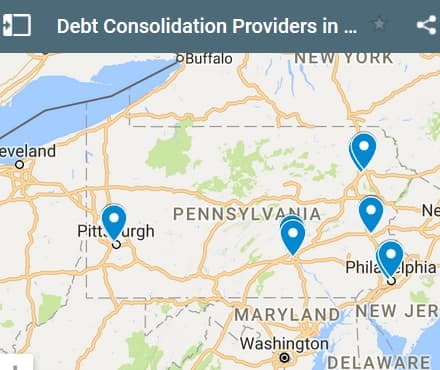 If you live in Penn State and you're trying to get approved for a debt consolidation loan, we hope our website helps you find a good lender and a low interest rate.